As these children can testify, a boxing ring can be used for dancing and playing, as well as boxing. They had the ring to themselves between bouts at Petersburg. 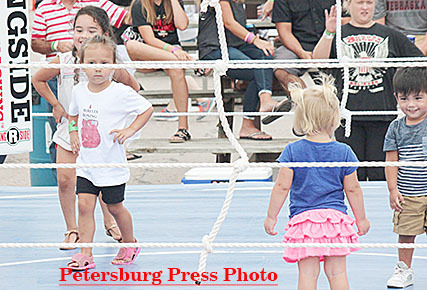 Petersburg again hosted big crowds for the eighth annual “Bash in the Burg” last Saturday, Aug. 6. A few extra people were on hand with the 7 Cities Century Bike Tour and “Bashin’ in the Burg” boxing tournament. A total of 264 riders arrived by 1 p.m. in the bike tour coming from Norfolk. 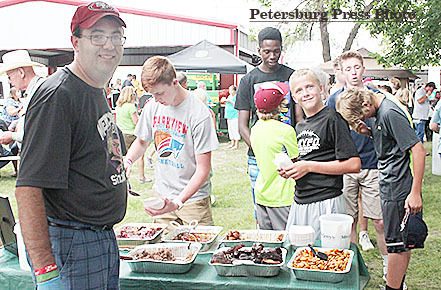 Petersburg Community Club provided lunch for the riders at the park on Saturday, as well as supper at the Legion Hall Saturday night, and breakfast at the Legion Hall Sunday morning before they departed. Angie Koch reported they were a “great group,” and a good crew of community club members turned out to assist with the meals. The boxing matches were also successful in their first year, with nine boxers including two female boxers. Trophies and belts were awarded to the winners in each class. Competitions were held in grilling meats, as well as breads, beers, wines and other concoctions. Midwest Barbecue Association judged the grilled meats, with 14 grilling contestants. 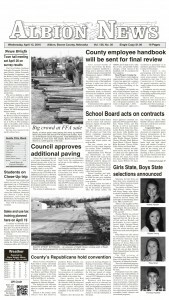 See this week’s Petersburg Press and Albion News for competition results. Mike Mapel was one of the grillers feeding the crowd at Petersburg’s Bash in the Burg.